JWR can provide a wide range of standard and custom conveyors based upon your application. From large capacity steel belts to low capacity slider bed conveyors, we can supply you with the perfect conveyor for your needs. JWR can provide you with a wide range of standard and custom conveyors based upon your application. 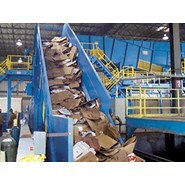 JWR works with Hustler to custom design conveyors to meet your solid waste and scrap handling requirements. Our steel belts are available with flanged sintered steel rollers with hardened steel bushings that provide maintenance free service. The hinges can be channel reinforced and include AR wear strips. Heavy duty, double strand, C1045 steel chain with precision die punched inside and outside links are standard. Our overlapping offset style side wings minimize material spillage. Hustler steel belts are available in 18" to 8' widths and virtually any length. Heavy duty drive assemblies are standard and meet exact load requirements. Other features include shear pin sprocket hubs for overload protection, heavy duty open frame construction, and load bars to limit deflection of the belt under impact. 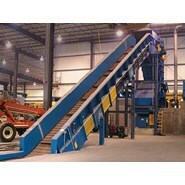 We supply our conveyors in large segments for ease of installation and minimal assembly time at the job site. Hustler Roller Chain Belt Conveyors are an exceptional lower cost alternative to steel belting in lighter duty applications. They are used often to feed a sort line or as an infeed into a baler. The belting on this type of conveyor is either a multiply rubber or PVC style, based on application. Our belting is available in a variety of thicknesses, plys, and materials with widths from 18" to 104". Performance by these belts is highly efficient.